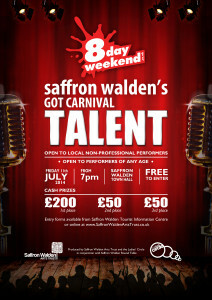 Saffron Walden’s Got Carnival Talent! 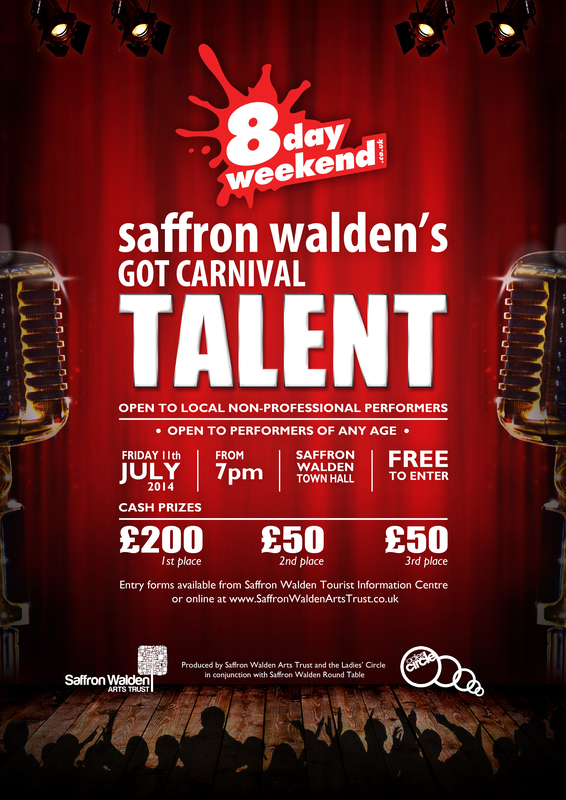 This year, Saffron Walden Arts Trust and Saffron Walden Ladies’ Circle are delighted to be putting on Saffron Walden’s Got Carnival Talent in the Town Hall on the evening of Friday 11th July. The competition is open to non-professional performers of all ages, who live in and around Uttlesford District. Entry to the competition is free, and there will be a prize of £200 for the winner, and £50 each for the two runners-up! It will be a great opportunity to see the best of upcoming local talent. There will be a bar, raffle, and guest performance from Liberty Anstead, a prize winner from last time. Tickets for the concert are available from the Carnival Caravan on market days, or www.8dayweekend.co.uk – £7 adult/£5child/£20 family (2 adults + 2 children).